The governor and others talked up his record, high-speed rail, and algae at a tour of algae specialist Solazyme. SOUTH SAN FRANCISCO -- California Gov. Arnold Schwarzenegger told a group of reporters that high-speed rail could do more than curb the pollution coming from jets. It could bring tourists too. "It was a great experience. It was like going to Disneyland," he said, referring to a ride on the high-speed rail system in France last year. "It is not just about environmental benefits. It is a great tourist attraction. You could have people come to California just to ride the train. "Our whole train system is outdated. We need to build high-speed trains, not ones that go 80 miles an hour to 100 or 120 miles an hour, but 220 miles an hour," he added. Schwarzenegger, however, wasn't speaking at CalTrans headquarters. He was on tour of the facilities at Solazyme, the algae oil manufacturers in South San Francisco. Arnold took a tour, held up some beakers of algae and in general touted his environmental record, which, among governors, is quite high. This week he signed an order under which California will try to get 33 percent of its electricity from non-renewable resources not including big hydroelectric dams. California is now aiming to hit a goal of 20 percent renewable by 2010. The governor was also asked whether he would follow the plan to adopt carbon taxes à la French President Nicholas Sarkozy. Schwarzenegger said France had a lot to offer – he even went to Cannes in his days as an actor – but dodged making any comments on the carbon tax. • Solazyme said that is has begun to ship algae oil to food producers. Earlier this year the company set up a lab to develop algal oils for food. The company can get food oils to market faster and fool oil actually sell for higher prices than petroleum or diesel. Imagine the cost of filling the car with virgin olive oil. Solazyme discussed using algae oil for cooking before but this is the first time it has said it is selling algae oil for revenue. Right now, though, it's still a small amount. • The company showed off a new food: algae milk. "It tastes like soy milk or almond milk, not cow milk," said CTO and co-founder Harrison Dillon. The milk, interestingly, is made from the protein, oil and fiber from the algae, not just the oil. 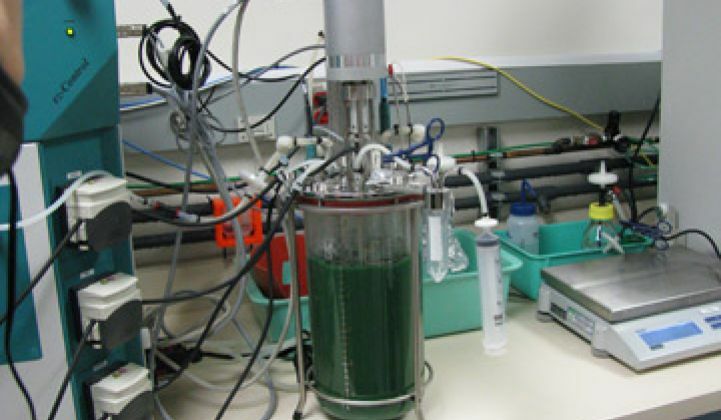 Many algae companies have been trying to come up with strategies for selling the algae protein. So far, a number have said they will sell it to animal and pet food producers. Algae milk, potentially, could allow algae producers to sell the protein into a higher-margin market. • Solazyme also talked up tests conducted by third parties that show its oil could reduce greenhouse gases. The firm hired by the state of the California to conduct environmental testing said that Solazyme's oil emits 85 percent fewer greenhouse gases on a well-to-wheel basis than conventional diesel while a study by National Renewable Energy Labs stated that algae oil reduces tailpipe hydrocarbons and particulates by 30 percent. "We've taken a 130 million year old process or making crude oil and compressed it into the course of a few days," said Dillon. But watch out when Solazyme calls its oil "crude." It is not a hydrocarbon (the stuff that comes out of ground). It is a lipid substance. In other words, it's "crude" in that it is unprocessed, but not "crude" in the way most of the world uses the term. • The Cabinet Minister for Foreign Trade from France, who also attended, said that France intends to get 20 percent of its energy from renewable resources by 2020. That total does not include nuclear power.